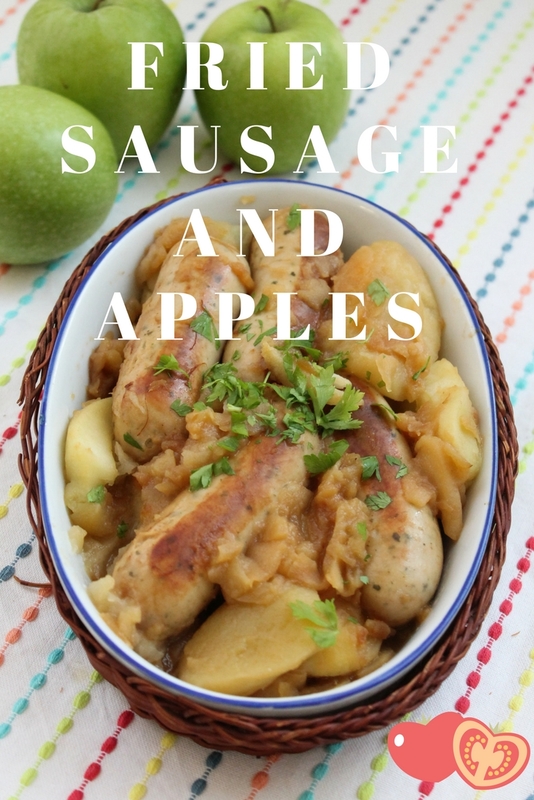 Nothing goes better with fried sausages, especially ones made with pork, then apples. The recipe for this classic combination comes from the newly released book, chock full of information, The Hamilton Cookbook: Cooking, Eating, and Entertaining in Hamilton’s World by author Laura Kumin. Hamilton the Musical debuted on Broadway in August 2015 but by Christmastime that year, both of my daughters were completely smitten and knew every single word. Each time we got in the car to go somewhere, Bluetooth automatically hooked up to their phones and the sing-along began. The tunes are catchy, the story engaging and I was drawn in as well. I can’t sing along as rapidly or as accurately as they can, but I thoroughly enjoy the music and lyrics. If you follow me on Instagram, you know that this past August my daughters and I traveled the width of the United States in a rental car, from the east coast of Massachusetts to the shores of the Pacific near Los Angeles. The Hamilton soundtrack accompanied us along the way. 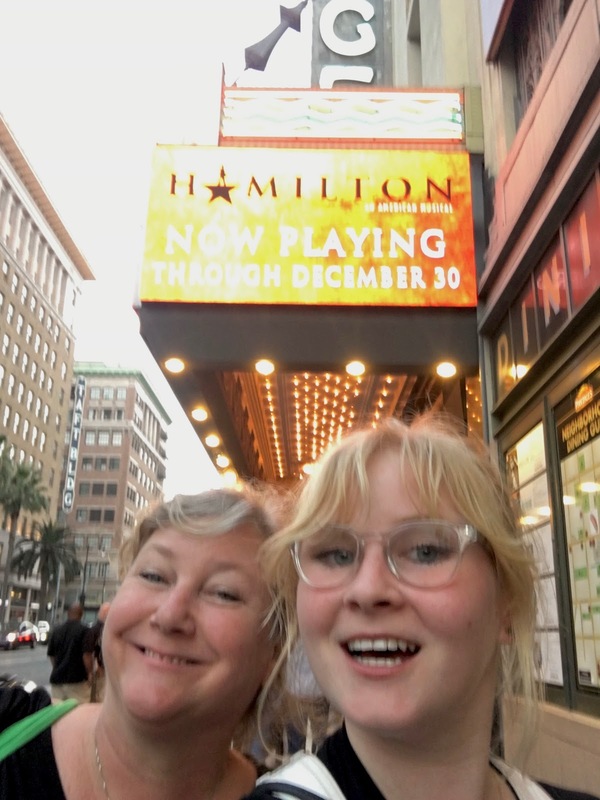 Much to our delight and surprise, when we reached LA, we were able to buy last minute tickets to a performance of Hamilton at the Hollywood Pantages Theatre where it had just opened. Sure, we were in the very back row, but who cares? We were ecstatic to be in the audience at all! 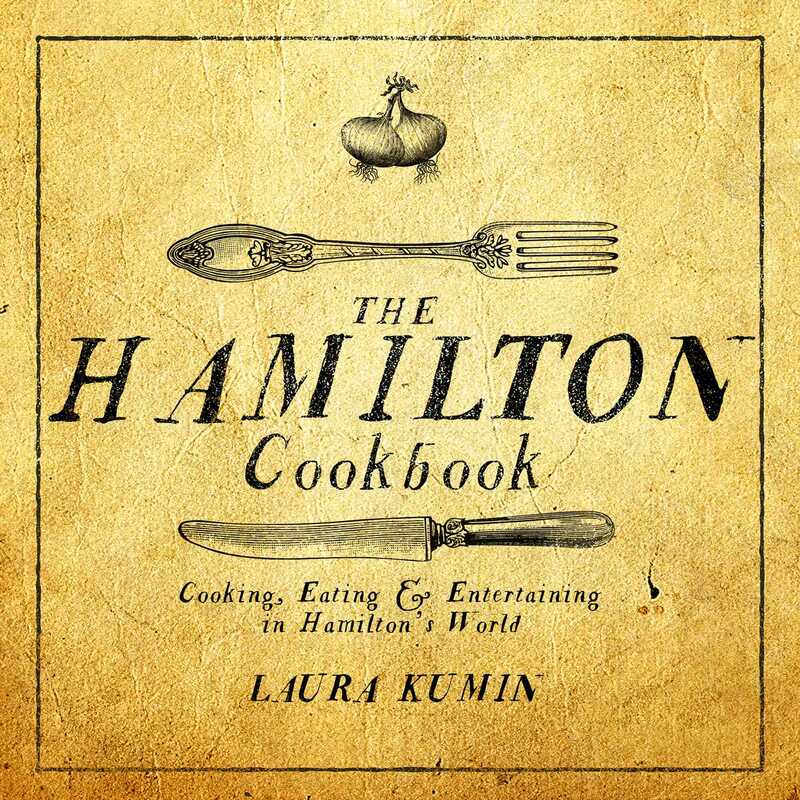 This is all to explain why I jumped at the chance to review Laura Kumin’s newly released The Hamilton Cookbook: Cooking, Eating, and Entertaining in Hamilton’s World. 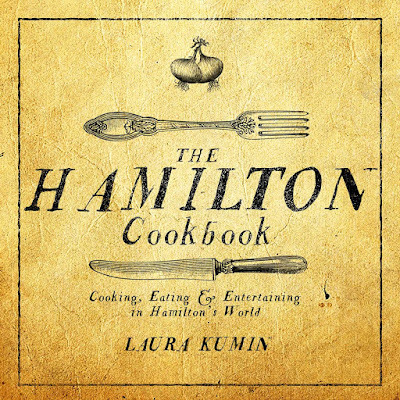 With her background in research and skills in the kitchen, I knew that Laura would be the perfect author to combine two of my favorite things, cooking and Hamilton. Aside from the 30 recipes, Laura shares a whole lot of historical information on the life and times of Alexander Hamilton. If you are a fan of the show, or the man, you are going to love this book. The publisher did send me one book but (keep this hush-hush, please!) I had already preordered another for my son-in-law as a Christmas gift way back in October. I was that excited about this book! From The Hamilton Cookbook: Cooking, Eating, and Entertaining in Hamilton’s World. Recipe reprinted by permission. The Hamilton Cookbook takes you into Hamilton's home and to his table, with historical information, recipes, and tips on how to prepare and serve the food that our founding fathers enjoyed. It's on sale now at Amazon (<affliliate link) or your favorite bookstore. The Art of Cookery Made Plain and Easy. This dish is great for a weeknight dinner; it is quick to prepare and uses just one large pan. It makes a full meal with just a salad and a loaf of crusty bread. 4 to 6 apples, preferably of mixed varieties, peeled and quartered. Any apples that keep their shape will work (e.g., Granny Smith, Yellow and Red Delicious, and Fuji). 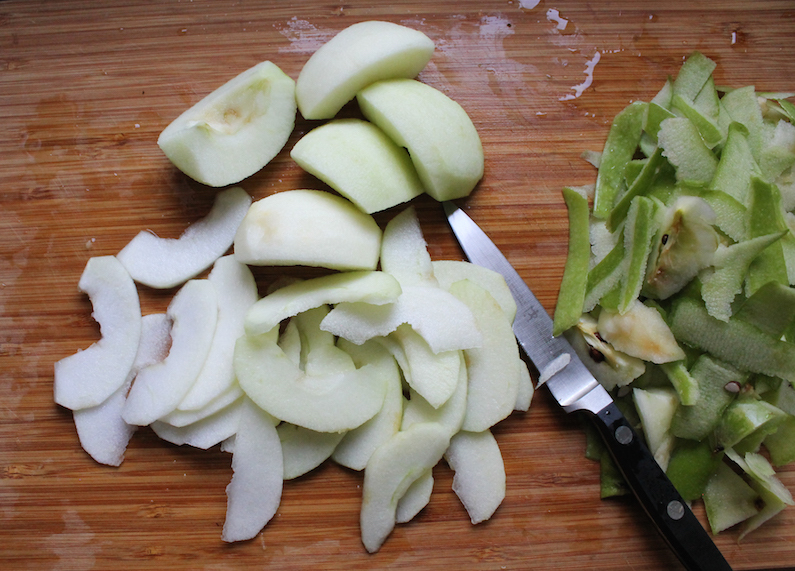 Quarter, and thinly slice half of the quartered apples. 1. In a large, heavy pan, start the sausages cooking under medium-high heat. 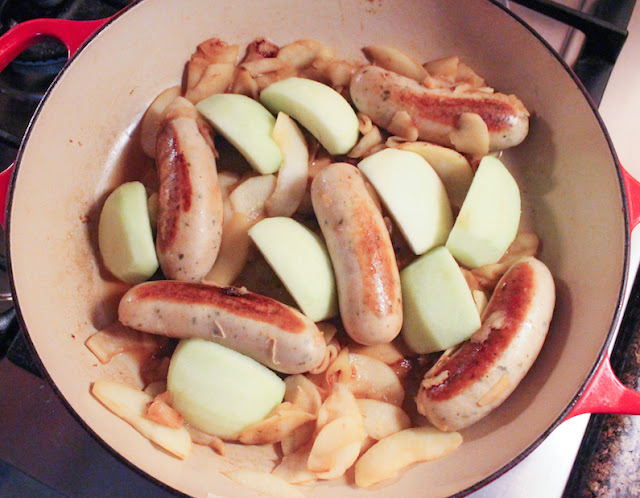 As soon as the sausages begin to render their juices, add the thin apple slices. Turn both the sausages and the apple slices so that they brown evenly. 2. Once the apple slices begin to brown, add the apple quarters, and stir occasionally. After 2 to 3 minutes, cover the pan for a few minutes. That helps the apples soften and brown. It will also allow a bit of liquid to accumulate in the pan. Uncover the pan and continue cooking until the sausages are fully cooked. 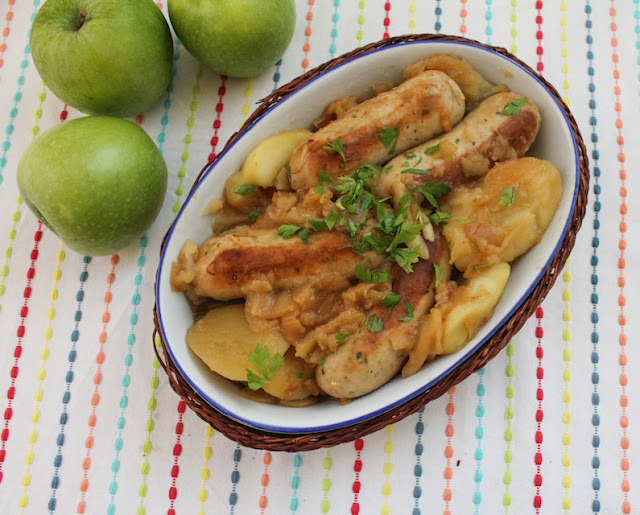 (The time required to cook the sausages depends on their thickness, typically about 10 to 15 minutes. You can ensure that the middle cooks thoroughly by cutting the sausages down the middle vertically to butterfly them after 10 minutes, laying them flat to continue cooking for another 3 to 5 minutes.) The thin apple slices will slightly disintegrate into a chunky applesauce, while the quarters will remain whole. 3. 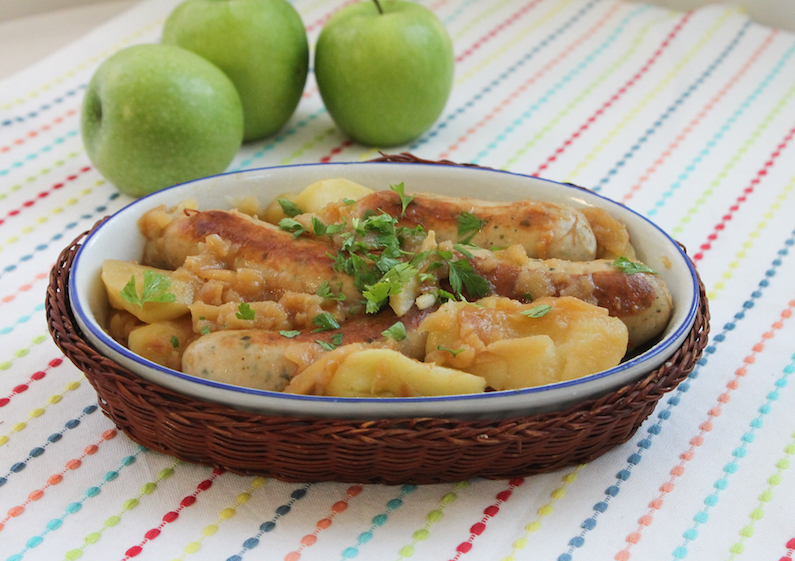 Serve on a platter with the sausages in the middle along with the applesauce, surrounded by the apple quarters. Want to win your own copy? Enter below. Entrants must be 18 or older with a shipping address in the continental United States. The winner will be randomly chosen at the close of the entry period. He or she will be notified by email and must respond in 48 hours or an alternate winner will be chosen.